"On January 16, 2013, President Barack Obama issued 23 executive actions against your 2nd amendment Constitutional right to bear arms. He did this without the consent of Congress which in itself, violates the foundation of the Constitution and the co-equal branches of government. In response to these unconstitutional actions by the President, on .223, February 23, 2013 the American people will stand together in defiance to protect the right that protects ALL of our rights, the 2nd Amendment! They will organize locally so that they may band together neighbor to neighbor and reassert their community's right to determine their own destiny!" This is from the website, Day of Resistance, a group that is organizing Americans across the country to stand up against the unconstitutional actions of this President. 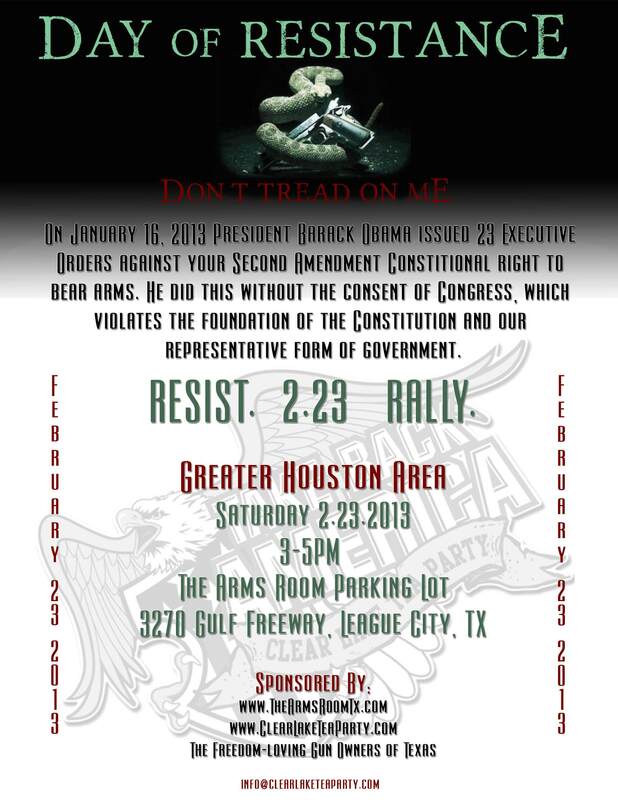 In the Houston area, the Day of Resistance Rally is being organized by Dale Hulls and the Clear Lake Tea Party. You may remember, this is the group that organized last years successful "Saddle Up Texas Straw Poll" event which help launch the successful campaign of now U.S. Senator Ted Cruz. The rally will be held on the grounds of The Arms Room, a popular Houston area gun store and shooting range on Saturday from 3-5 p.m. The Arms Room also made the news this week when Comcast, who recently merged with NBC, cancelled their advertising contract because they are in the gun industry. This event is a great opportunity to send a message both to the President about the Second Amendment, and to Comcast for their discrimination against firearms related companies. Huls said, "In conducting this event, safety is our top priority." He reminded all CHL holders to be sure to follow all Texas laws in accordance with both concealed carry and open carry of any long guns. According to a Hulls, this location was chosen because of last week's resolution from the City of League City, Texas to "Protect and Defend the Constitutional Right to Keep and Bear Arms" which passed in a 7-1 vote of City Council. League City is the first city in the United States to pass such a resolution. Several other rallies are planned across Texas and the nation. An entire list of rallies across the country can be found on the DayofResistance.com website. Location: Confederate Park on I-35 (Take Central exit, go south on service road approx. one half mile. Park is on the right.). The weather forecast for the event looks great! 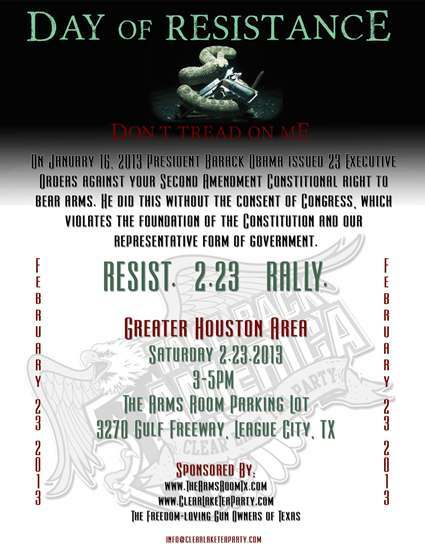 This is an excellent opportunity for you to come out and show your support for your Constitutional rights. I will be attending the Houston Day of Resistance. If you are in the area, I hope you will join me and say hello.